On February 13, 2012 a male Ukrainian tourist and his friend were snorkeling off the City Sharm Hotel in Sharm el-Sheikh, Egypt, an area of the Red Sea world renown by divers for its crystal clear water and underwater sights. A boat came by at high speed and its propeller struck the Ukrainian in the head while his friend was filming the dive. A 13.5 minute video of the dive begins with about 3.5 minutes of the dive, the diver is struck by the propeller at about 3 minutes and 38 seconds on the video, then the video camera remains on, but very shaky during the ensuing chaos. As seen in this photo taken from the video just minutes before the accident, the diver was using a mask with a yellow snorkeling tube and blue flippers as he explored the area. We captured several still images from the video near the time of the strike that illustrate the content of the video and present them as the sequence of 11 images below. Without additional information (which we provide a request for below) many of our comments are speculation based on the video. Additional information could confirm or change them. Plus we are aware that images are sometimes reversed by cameras or online posting methods so any comments below about left, right, port, or starboard are just being made about the way things appear to be in the images and may not be correct. It only takes something of the nature of two seconds from the boat appearing in the top left area of the video at a distance a few times further away than it appears in the image above until the diver is struck. The diver is just below the surface, probably looking downward and not seeing the oncoming boat, while breathing through the yellow tube. The diver may become aware of the boat and attempt to dive beneath it. The diver appears to be struck by the boat and his head is pushed down. He may have been knocked out, and/or have a broken neck. His head and upper body are pushed down hard. His extremities (arms) are still up where they were before the strike (water is resisting them and they are slower to follow ). His body continues downward as the boat is rapidly passing over him. The yellow debris near his head is probably pieces of his mask and breathing tube that broke when he was hit by the boat. The diver is beginning to become engaged with the starboard side of the drive. Note his trunk has rotated and his upper body is almost pointed at the side of the gearcase. His left arm is raised, perhaps to block his impact. His right hand is not visible, but later photos indicate it was hit as well, perhaps by the port side of the propeller. The diver may be attempting to get in the fetal position, or he may have been knocked out by his contact with the boat. His head is lowered and is milliseconds from impact. Later photos show injuries to his upper right forehead. The left side of his head may have been outside the radius of the propeller. Injury photos clearly show major damage to his head, but it is more intact than some might anticipate. He apparently lived for several minutes after the strike. One of the more striking events of the accident is how quickly his body is turned 180 degrees (from feeding linearly toward the boat, to rotating to almost face the side of the gearcase, to spinning around and facing the propeller as the boat speeds away). Just a frame or two after contact with teh propeller the trunk of his body is already rotated 45 degrees. 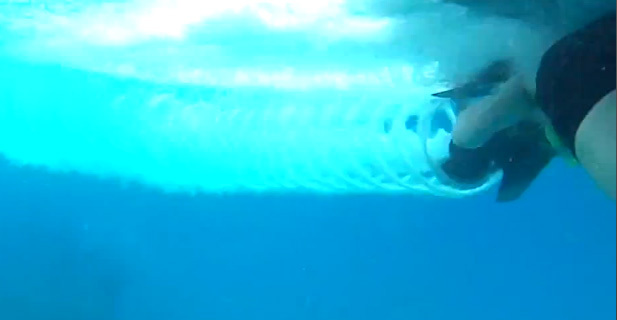 His legs and feet are slowed by the resistance of the water and they lag in the rotation. His body continues to swing around and you see the intense torque placed on his legs as the water resists their rotation and the drag of the flippers slows the rotation of his ankles. He appears to be swung all the way around and is now facing or least pointed at the propeller as the boat leaves the area. It would be very interesting to do a biomechanical analysis of the forces involved as his body is so quickly turned around in the water. It is not exactly clear what the driving force is. He might have became entrapped in the propeller as the boat sped by and thus it yanked his body around till it was turned loose, blunt force trauma from the drive, skeg, or propeller itself may have knocked him around, or some other mechanisms may be involved. The actual video is on YouTube. As mentioned earlier, the prop strike is at about 3 minutes and 38 seconds on the timer and the video becomes wildly choppy and bouncy after that. It is also available in 780 HD if you select it from the quality tab. Please do not watch it if you get vertigo easily or if your have epilepsy that can be triggered by similar videos. We considered embedding the video on this page but its cover image is pretty traumatizing so we did not. You can view the video at Propeller Strike Video. Although the video is very choppy after the accident (seems like it may be hanging from a persons neck as they tend to the victim) it does provide a nice timeline after the accident. Many people talk about how quickly the water turns red with blood after a propeller accident. That time can actually be measured in this video and it is just a matter of seconds. We have spoken before about how quickly things can change from a fun weekend or vacation holiday to life changing experiences. The video dramatically illustrates that point. He is diving in a beautiful area and if he ever does see the oncoming boat, it is probably in the last second of his normal life, he is fatally injured by the propeller and dies shortly later. Those on board the boat he was rescued in are also traumatized by the experience. Comments with the video say he bled to death due to poor medical and emergency preparations at the site. Legal cases often pit both sides against one another with different explanations as to how a person’s body engaged the propeller, especially those that fell overboard, or if they even hit the propeller at all. The industry often claims their injuries or at least their more severe injuries were caused by hitting the drive itself or the skeg (lower portion of the drive). While this video provides some tremendous views, it still does not answer all the questions by itself. The accident report, a copy of the original video, medical reports, and an autopsy report would be very useful in trying to better explain exactly what happened. I strongly suggest those records be captured before they become no longer available. Acquiring a copy of the original video in higher resolution than the ones posted on YouTube. The records above, in conjunction with the film, could be used to conduct a biomechanical analysis of the accident. This accident, the first known propeller accident to be recorded on underwater video, could then be used to gain insights into how to prevent or reduce the severity of accidents like this one. FRC-SARMED Red Sea, Sea Ambulance Response (SAR), may have some information. Please note, that diving destinations are often reluctant to cover diving accidents in the press or to speak about them as they do not want to do anything that might reduce tourism. We encourage those with U.S., Egyptian, or Ukrainian government connections to help in collecting more documentation surrounding this accident and would especially appreciate any help the U.S. Coast Guard could offer. We recognize the nation of Egypt is under extreme pressures at this time (regime change, election, unrest, etc.) but would appreciate any help anybody could offer. Just click on the “Contact Us” tab in the navigation bar to visit with us.